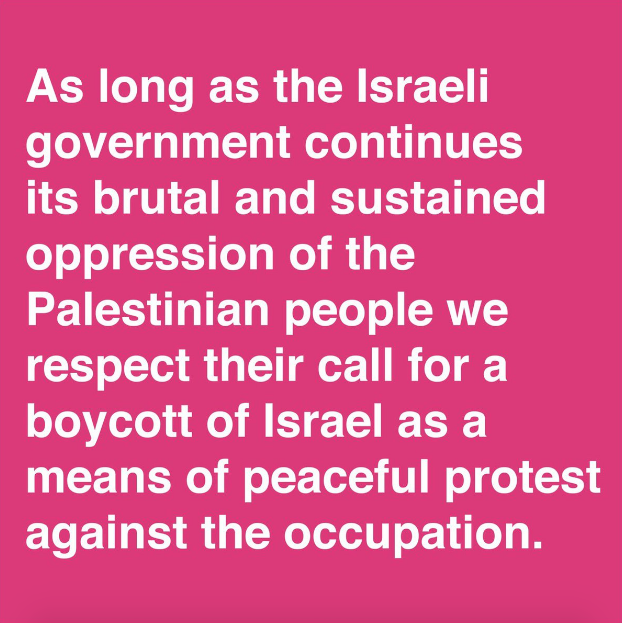 Across Twitter, Instagram and Facebook, DJs including Ben UFO, The Black Madonna, Ciel, object blue, Violet and Noncompliant have shared the hashtag #DJsForPalestine along with the image message that reads as follows: "As long as the Israeli government continues its brutal and sustained oppression of the Palestinian people we respect their call for a boycott of Israel as a means of peaceful protest against the occupation." The campaign has been coordinated by the PACBI (Palestinian Campaign For The Cultural And Academic Boycott Of Israel) and is part of a movement to encourage action and involvement from electronic music figures in discussions surrounding BDS (Boycott, Divestment And Sanctions). BDS is a global campaign promoting various forms of boycott against Israel in the hope that international pressure can lead to the country meeting its "obligations under international law” including its leaving of the occupied territories of Gaza and the West Bank, the removal of the separation barrier, equality for Arab-Palestinian citizens of Israel, and promotion of the right of return of Palestinian refugees. In response to #DJsForPalestine, a spokesperson for PACBI said, "We welcome the DJs, producers, record labels, collectives and electronic musicians today endorsing the Palestinian call for the cultural boycott of Israel. Cultural boycott played a key role in the South African anti-apartheid movement, with progressive artists refusing to whitewash the oppression of the black majority. There should be no business-as-usual with Israel's regime of occupation, apartheid and settler-colonialism as long as it denies Palestinians our fundamental rights." Since showing solidarity as part of #DJsForPalestine, Room 4 Resistence x Cómeme’s party at ://about blank has been cancelled by the club’s owners. The Berlin club released a statement which read, “Due to the irreconcilable differences, we decided to cancel the upcoming Room 4 Resistance x Cómeme at our venue. Calls for boycotts for such as against Israel, shared by the R4R-collective, profoundly disrespect our political understanding." Update: Room 4 Resistence have shared a new statement in response to the removal of their party from ://about blank's bill this weekend. It reads: "It is possible to oppose a state without persecuting its citizens. Room 4 Resistance welcomes all citizens of the world to our events, as long as they respect our safer space policy. Israeli citizens are just as welcome as Palestinians, Syrians, Tunisians, Somalis, Turks, Lebanese, and all the other immigrants and refugees who are at constant risk of violence in Europe. Room 4 Resistance is here to bring politics back to the dancefloor, and we stand in solidarity with the Palestinians". You can read the full statement here.